The narrative voice can be its own form of flogging throughout Episode 1 of Starz’s Outlander. In the person of heroine Claire Randall (Caitriona Balfe), it interjects over and over again in a very slowly unfolding table-setter for this otherwise picturesque adaptation of Diana Gabaldon’s string of romance-driven bestsellers. Be still my heart? No, but could we just get on with it? Setting the mood is one thing. Too much exposition is quite another. By Episode 2, also sent for review, the action has picked up while all that off-camera droning has largely stifled itself. The Starz network, which for the most part has lived in the past with its original series, seems to be in no danger of having a Game of Thrones phenomenon on its hands. But it might have an involving swords ’n’ bodice tale in due time, with women composing the majority of Outlander’s audience after Starz’s bloody, brawny Spartacus series appealed mostly to men. It’s otherwise nearing Halloween, with ghosts afoot in the form of play-acting townies. But first comes a visit to Castle Leoch, which is in ruins but also proves to be a suitable turn-on after Claire and Frank traipse around within. Claire is starting to feel ill at ease and out of place, though. And sure enough, she’s finally magically transported to 1743 Scotland, where kilt-clad lads are squaring off against evil British Red Coats led by the twisted Jonathan Randall Esquire (also played by Menzies). “I wanted it to be a dream but I knew it wasn’t,” Claire needlessly narrates. She also again spouts her favorite exclamation -- “Jesus H. Roosevelt Christ!” -- when a rough-hewn band of Scottish freedom-fighters is clueless to her demands for medical supplies to treat the injured and very handsome Jamie Fraser (Sam Heughan). It’s at this moment that Outlander begins to perk up. Episode 2 mostly takes place within Castle Leoch, where the outwardly benign Colum MacKenzie (Gary Lewis) rules a roost of unruly Scots. Still tending to Jamie’s wounds, Claire learns of his previous capture by the British, who flogged him both before and after his sister was raped. He promises she’ll be safe in his company. Those familiar with the books -- or those who have never read a page of them -- will have no trouble deducing that a coupling’s a comin’. Outlander also includes a kindly, roly-poly cook, Mrs. Fitzgibbons (Annette Badland), who encourages Claire to “call ‘oot’ if you need anythin’ else.” What she wants most of all is safe transport back to England. But Claire’s prowess as a “healer” and suspicions that she could be a spy are conspiring against any easy way outs. 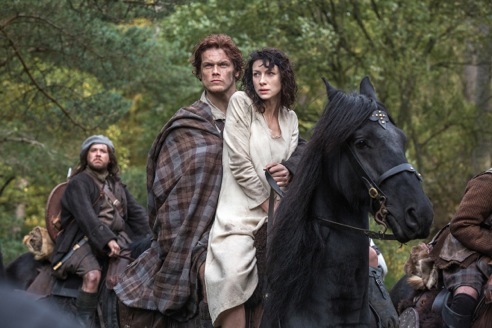 Balfe is fine -- but not dandy -- as Outlander’s central character. The most effective performance so far is from Lewis as the skeptical Colum, whose legs are badly bowed from a degenerative disease. He conveys a sense of both fairness and menace, running Castle Leoch with a hand that is far steadier than his feet. Outlander is beautifully shot throughout, which somewhat makes up for some of the early tedium. It may not ever rise to the level of enthralling. But by the second episode, the story at hand is flexing a firmer grip.